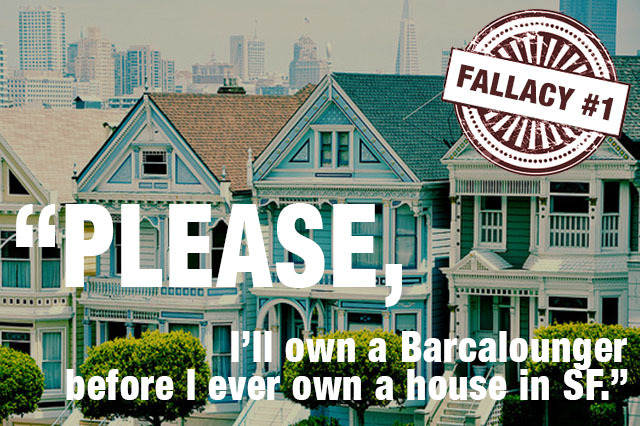 FALLACY #1: You'll be kind of old by the time you save enough to buy a house. THE TRUTH: Reduce your down payment and you're already over the biggest home-buying hurdle. If you step back and look at the problem of home buying, DOWN PAYMENT looms overhead in glowing, neon letters. It's true that you don't pay the total value of your new property upon signing, but you sure are going to pay 20% of it—and in a market like SF where the average home sells for $1.4 million+, that is a paralyzing amount of money. It's so large that not only are you going to delay your buy date, you're going to end up affording less, which means you're going to spend every day talking yourself into loving properties you wouldn't normally think twice about. Plus, it's not just buying that gets crazier all the time; your rent and cost of living are only rising, so with each passing month you have less to squirrel away in that new-house fund. Not to mention, 42% of renters polled said they wished they'd bought instead of rented this time around. That's a hell of a lot of regret. FINE, SO WHAT'S THE ANSWER? Blow off a traditional mortgage. In an industry some would call a dinosaur, it's a big deal that there are new ways of borrowing money out there. With lenders like SoFi, you can buy your dream home sooner (gasp!) by putting as little as 10% down on a home loan with no mortgage insurance. Plus, with their flexible debt-to-income limits, you may qualify for more financing than what traditional lenders can offer. It sounds too good to be true, but it isn’t. Having a place to call your own in a treacherous market like this really is attainable. We don't bank, watch TV or order food like our parents, so why buy a house like they did? See what low down payment options SoFi can offer you. It only takes two minutes. Get started here. Stay tuned next week for another common anxiety about home buying and tips for subverting a murky industry with affordable rates, way less paperwork, and—who knew!—transparency. SoFi Lending Corp. NMLS # 1121636. Terms and conditions apply. See SoFi.com/mortgage for eligibility and licensing details.